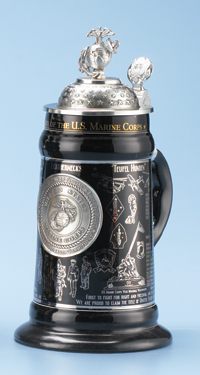 This stein has been crafted to honor the service of the U.S. Marine Corps since their inception. The body of the stein is a smooth, black glazed, high quality stoneware decorated with a platinum wrap around design. Along the top border are the words, The History of the U.S. Marine Corps. The left side of the platinum design features a images of various military vehicles as well as a variety of Marine emblems and a picture of the birthplace of the Marine Corps. Also along the left side is the first half of a timeline detailing some of the major events and accomplishments in the history of the Marine Corps from 1775 to 1947. A pewter badge depicting a Marine Corps seal encircled in the words Always Faithful - Semper Fidelis - First To Fight - Honor, Courage, Commitment, appears at the center of the wrap around decoration opposite the handle of the stein. The right side of the platinum design features more military vehicles, Marine emblems and the U.S. Marine Corps War Memorial. The timeline from the left side is continued on the right beginning with 1950 and concluding in 2005 with the Counter Insurgency Mission in Iraq and the Marine Corps support after Hurricane Katrina. A detailed pewter figurine depicting a three dimensional representation of the Marine Corps official emblem complete with anchor, globe with the northern hemisphere to the front and eagle with outstretched wings, is fixed on top of the ornamental pewter lid. Limited edition of 5,000 individually numbered pieces.